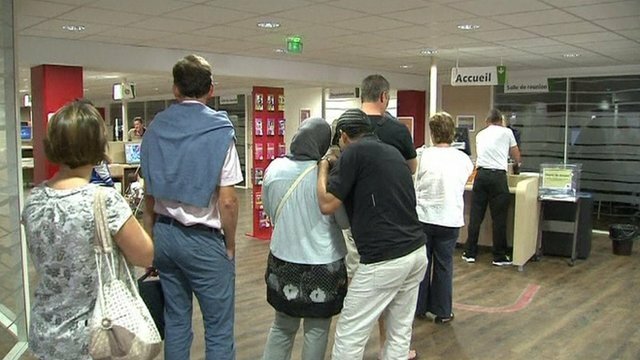 The number of unemployed people in France has topped 3 million for the first time since 1999, according to latest labor ministry figures. August’s jobless total rose by 23,900 to 3.011 million, a 9% increase on a year earlier, marking the 16th consecutive monthly rise. However, the government blamed the previous regime of Nicolas Sarkozy. “These three million unemployed embody the failure of economic and social policies undertaken during the last few years,” the labor ministry said in a statement. “In the face of this difficult report, the government is determined to implement as soon as possible reforms,” it said. The news will, however, add pressure on President Francois Hollande, who came to power on a promise to revive the economy. He won power in May, pledging to revive the eurozone’s second largest economy, tackle rising unemployment, and reverse industrial decline. However his approval rating is now at it lowest since he assumed power, pollsters say. Since May, major companies have announced thousands of layoffs, including carmaker Peugeot, drugmaker Sanofi, airline Air France-KLM, and retailer Carrefour. Analysts warned that the unemployment situation could worsen. The French economy has posted three consecutive quarters of zero growth, and forward-looking data suggests it may continue to flatline. “Confidence is weak both with companies and, even more so, with households. It’s not really surprising given the economy has fallen in recession and the private sector is facing the biggest tax hike in decades,” Bruno Cavalier, analyst at Oddo Securities, wrote in a research note. The 2013 budget, due to go before the cabinet on Friday, is expected to contain more than 30bn euros in budget savings, and fresh tax rises. The government has forecast 0.3% growth for the year, and has so far kept its 2013 target at 1.2%, which many economists now consider unrealistic. France’s central bank this month predicted that the economy would contract by 0.1% in the third quarter after flatlining for the first half of the year. Amid the gloom, French consumer confidence slipped two points in September from the previous month, the national statistics office said on Wednesday.